A family photo! The Princess disagreed with the pose, so she made up her own. I always appreciate the opportunity to take a break. Unfortunately, I can’t always predict when I won’t have the willpower or motivation to do things that I enjoy doing when they need to be done. Sigh. After last month’s deadlines, I had anticipated a healthy amount of free (unscheduled) crafting time this month. I spent more time on the couch than I care to admit. On the upside, the Princess and I are caught up on our TV shows. 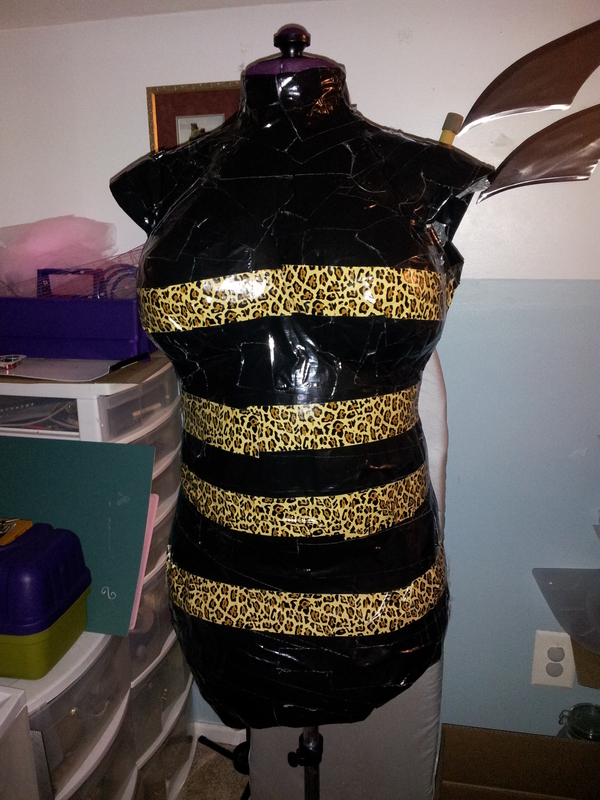 In order to work on my costumes for the next two events, I wanted to get my duct tape dress form completed. Husband had free time, so he did all the hard work. Following tips from a number of tutorials, we used plastic wrap instead of a t-shirt for the base, regular silver duct tape, then black (less sturdy) duct tape, and finished with “fashion” duct tape to mark common measurement lines. I put the cast over my existing dress form (on the lowest possible settings) and stuffed her with blankets and fabric scraps. The updated form is more helpful than she was in that I can better see how things will fit my body, but the stuffing job wasn’t fabulous, so she doesn’t squish into a corset quite as well as I do. Regardless, I love her new curves. After the reconstructive surgery to my dress form, I whipped up my entry for the Colette Patterns – Laurel contest. I finally used a Joann’s special fabric that I had planned for another dress two and a half years ago. The sheath dress pattern was very easy to follow, and I appreciated the tips and tutorials on the manufacturer’s website. I picked up neutral shoes and a bag and wore the dress to a spring wedding. All seams were intact when I came home, so it was marked as a job well done. The pictures were uploaded to Flickr and tagged for the contest’s popular and print categories. For the bachelorette party of the same wedding, I made an animal print headband to match the bride’s theme. I love this style and have two others made from quilting squares. They only take about 30 minutes to stitch up. Maybe I’ll post my instructions one day. Here’s our munchkin modeling for me. OH! And, I put up a makeshift backdrop so that no one has to look at my nicked walls and cluttered fabric space in the background. You can see it in the Laurel dress photo. I turned a couple of hook screws into the ceiling and suspended beat up lining fabric from medium sized binder clips. With another couple yards of fabric, I could make a U, which would be ideal, but this works for now. This Saturday is Free Comic Book Day, and the whole family will attend in costume this year. 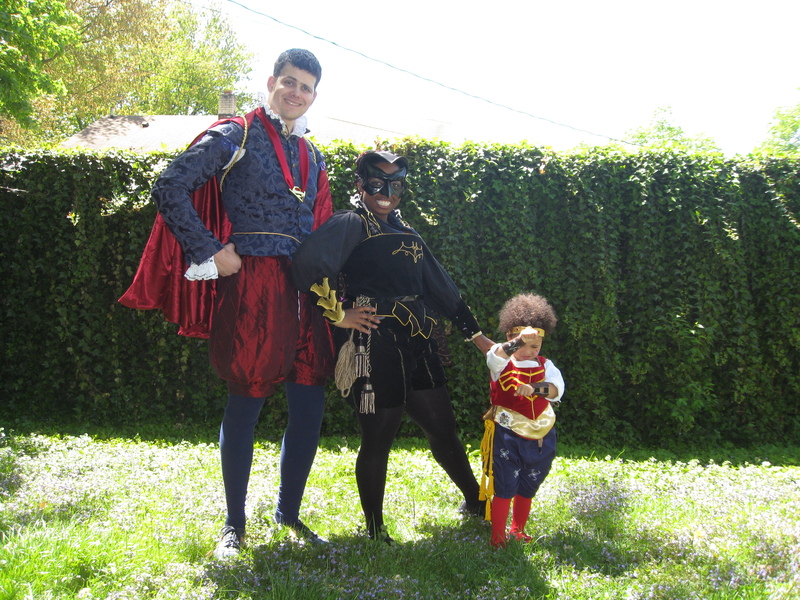 We’ll be representing DC, Rennie style – Superman, Batgirl, and Wonder Woman…er…Wonder Toddler. In the interest of time and being restricted to shopping only from my stash, she’ll be wearing a red velvet bodice with yellow-gold accents, blue twill breeches (either slashed or pearled), brown pleather cuffs with silver accents, and a gold satin headband with red acrylic gems. The outfit will go over her white undershirt, red tights, and red velvet shoe covers, which might get satin-stitched if I don’t forget. I’ve also coiled her golden lasso and secured it in the bodice lacing. The last thing a toddler needs is a potential tripping hazard, but I don’t mind having something to hold on to in the crowd. My only goal for FCBD is to get a good picture of our little super team; getting through the lines will be a bonus. Here’s a preview; I will post a family picture as soon as possible. Progress on the 4th Doctor’s scarf continues. Remember: No more than 30 minutes four days a week…what did you expect? 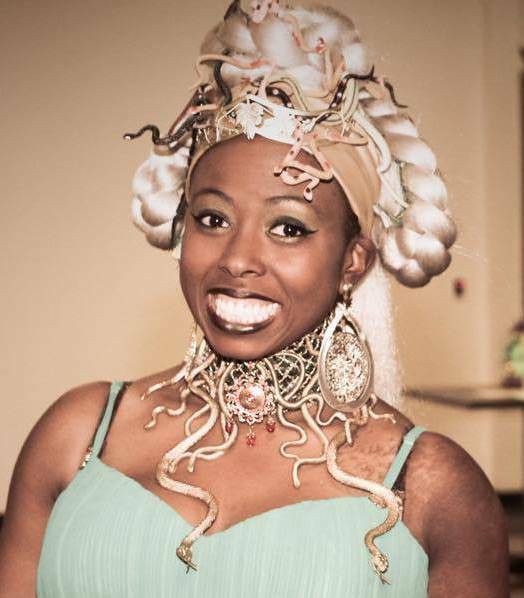 For May, I’m looking forward to doing a minimum of sewing for the Steampunk World’s Fair. I have two costumes packed and one to determine, plus last year’s Military Fairy as a backup. The costume conference is two weeks following that, and I have at least one major undertaking that I haven’t even started yet. I’ll try some refitting of older, smaller pieces and then, it’ll be a mad dash to finish in time. I see hot glue in my future. I think I love this time of year. Author SciFiCheerGirlPosted on April 30, 2013 Categories Events, News, ProjectsTags Batgirl, Comics, conference, DC, Doctor Who, dress, Dress form, duct tape, headband, princess, Steampunk, Superman, Tyrant, wedding, Wonder WomanLeave a comment on May already? Green Linen Shirt Blog at WordPress.com.